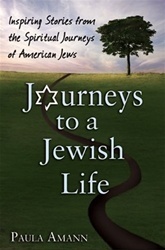 Paula Amann candidly probes these questions and more as she explores how secular and nominal Jews are blazing their own trails toward a vibrant, twenty-first-century Judaism. With the ear of a journalist and the heart of a seeker, Amann weaves a tapestry of human stories--of alienation, connection, spiritual detours, and unexpected portals into a life of faith. The people you meet in this engaging book will throw a fresh light on Jewish thought and practice. And their tales of personal transformation might just renew your relationship with Judaism--or send you off on your own Jewish journey.